The Raqqa Diaries began as a series of short broadcasts on Radio 4's Today Programme. Now one of the most isolated and fear ridden cities on earth, no-one is allowed to speak to western journalists or leave Raqqa, without IS's permission. Those caught breaking the rules face death by beheading. Despite this, Mike Thomson, with the help of BBC's Arabic Service, found a young man who is willing to risk his life to tell the world what is happening in his city. Part of a small anti-IS activist group, the diaries were written, encrypted and sent to a third country before being translated. The diarist's father is killed and mother badly injured during an air strike, he is sentenced to 40 lashes for speaking out against a beheading, he sees a woman stoned to death. They show how every aspect of life is impacted - from the spiralling costs of food to dictating the acceptable length of trousers. At one point, the sale of televisions is banned. As Samer says, 'it seems it's not enough to stop us talking to the outside world, now we can't even look at it.' Having seen friends and relatives butchered, his community's life shattered and the local economy ruined by these hate-fuelled extremists, Samer believes he's fighting back by telling the world what is happening to his beloved city. 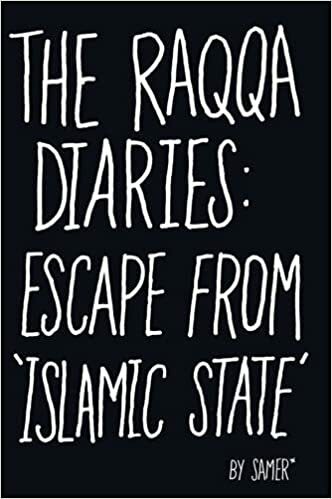 Raw, direct and profoundly affecting, THE RAQQA DIARIES is an important book by a brave young man, which allows unprecedented access to the brutal conditions that many Syrians are living under. The Raqqa Diaries by Samer is based on some short broadcasts made on Radio 4. As Raqqa was “liberated” by Daesh (IS) it became impossible to report from there. However a reporter from the BBC made contact with some people who were effectively underground there and one of them was prepared to offer a diary of his experiences and thoughts which were smuggled out and the broadcast. This is Samer’s story. It tells, in fairly understated language to me, of some of the day to day events affecting the people of Raqqa who now found themselves under Daesh rule. The sheer barbarity of some of the scenes is remarkable. That these are carried out by people who consider they are following a religion is frankly frightening. Indeed this book does show the fear felt by Samer and the inhabitants of Raqqa but it also conveys anger graphically too. I found this a very powerful story and it made me think far more about issues that I only hear as fairly sanitised headlines. The rawness of existence in Raqqa for ordinary people is vividly sketched. This is not a long book. It is simply written. It would not take much of your time to read it. It will probably make you think. It deserves reading by anyone with the smallest interest in humanity.